It is very sharp, it is very fast, it is very well built and it is one of the least expensive L lenses Canon makes. It is the highly regarded Canon EF 135mm f/2L USM Lens. If 135mm is the focal length you need, you will not be disappointed by the 135 L.
Look into the end of this lens and you see what seems like an unusually large amount of glass. From the looks of the resulting images, it must be really good glass. The Canon EF 135mm f/2L USM Lens is renowned for its image sharpness. More specifically, the 135 L has decent sharpness at f/2.0 with sharpness increasing to impressive at f/2.8. Especially impressive is this lens' corner sharpness where it puts most zoom lenses to shame. APS-C (1.6x) body users will find corners razor sharp at f/2.8 and stopped down to f/4, the entire full frame image circle is extremely sharp. Vignetting is strong at f/2 on a full-frame body, but images quickly smooth out when the lens is stopped down. Distortion is very well controlled with only slight pincushion distortion. Color and contrast are very nice. An f/2.0 aperture is extremely wide (fast) for this focal length. This the second longest focal length Canon EF lens currently manufactured with an aperture wider than f/2.8. For this reason (and more to follow), this lens is frequently recommended for indoor action sports photography. What comes with the 135 L's wide aperture is the ability to remove a distracting background from your picture. Isolate your subject - shoot in the lower aperture range for an excellent separation of the background. An 8-blade aperture helps keep OOF (Out of Focus) highlights round and smooth. As always with a wide-aperture lens, a bright viewfinder greets your eye. And generally, a wide-aperture lens enables the higher sensitivity AF points. The Canon EF 135mm f/2L USM Lens focuses fast and accurately even in low light - another important feature for an indoor action sports lens. Ring USM (Ultrasonic Motor) quietly and quickly locks focus and allows FTM (Full Time Manual) focusing. A focus limit switch is provided. Manual focusing is easy with a smooth and nicely-sized focus ring. Focusing is internal - the 135 f/2 does not extend nor does the 72mm front element rotate while focusing. With a close focusing distance of 3' (.9m), the 135 L has a not-bad-for-a-fixed-focal-length-lens magnification capability of .19x. This lens will not be confused with a macro lens, but will not have problems with most uses it is suited for. Adding a 12mm Extension Tube increases the maximum magnification to .29x and the addition of a 25mm Extension Tube yields a .41x magnification. Extenders, along with increasing the focal length, increase magnification. The Canon 135 L is compatible with the Canon Extender EF 1.4x. This makes a relatively fast and sharp 189mm f/2.8 lens for a relatively small additional expenditure. The 1.4x will decrease sharpness slightly and introduce some CA (Chromatic Aberration) and barrel distortion. I typically recommend a lens with a built-in 200mm focal length if you need a 200mm lens most of the time. The Canon 135 L is also compatible with the Canon Extender EF 2.0x, but you will probably not be thrilled with this 270mm combination wide open at f/4 as sharpness takes a bigger hit with this extender. The 2x adds some CA but little distortion. Like all Canon L Series Lenses, the Canon EF 135mm f/2L USM Lens has very good build quality. The size (3.2 x 4.4"/82.5 x 112mm) and weight (1.7 lb/750g) (and color) of this lens are not imposing - you probably won't get much attention with it. To review a common comparably-sized lens, the Canon 135 f/2L is very slightly larger and heavier than the Canon 16-35 f2.8L. The 135 L is shipped with a plain round but large-for-the-lens-size ET-78II lens hood. Round lens hoods are not as exciting looking as petal-shaped ones, but they sit on a flat surface far better. While hood works fine, I found its fit to be marginal with the multiple copies of this lens I've owned. The hood fits somewhat loosely and can be turned beyond its stop. The 135 L also ships with a Canon LP1219 Soft Pouch. The pouch is nice but not well padded. 135mm is a nice focal length to have - there are lots of uses for it - especially when you combine the f/2 aperture with the focal length. The Canon EF 135mm f/2L USM Lens makes an excellent indoor sports lens. To shoot indoors under typical gymnasium lighting, you often need f/2.0 or wider to get a shutter speed high enough to stop the action. The 135 L handles this well. Stage photography is another good use for the 135 L. How well this lens works for this purpose of course depends on your distance from and the size of the stage. And, if shooting more than one subject at f/2, they will need to be aligned on the plane of sharp focus to all remain in focus. This is a lens I often carry to dance or music recitals. The Canon EF 135mm f/2L USM Lens also shines in portrait photography. Some say it is actually too sharp - showing all facial flaws. My personal opinion is that I would rather start with perfect sharpness and post process any necessary correction into my images. And babies have perfect skin - show it off. This of course depends on how much subject you want in the frame and how much room you have to work in. Head shots are a good portrait style for the 135 L mounted on a 1.6x FOVCF DSLR. Many find the 135mm focal length too long for indoor portraits with a 1.6x FOVCF body - preferring the Canon EF 85mm f/1.8 USM Lens, the Canon EF 85mm f/1.2L II USM Lens or my personal preference, the Canon EF 70-200mm f/2.8L IS II USM Lens. Of course, if you have the space - use the 135 L. The 135 L's minimum focusing distance allows very tight portraits even on a full frame body. 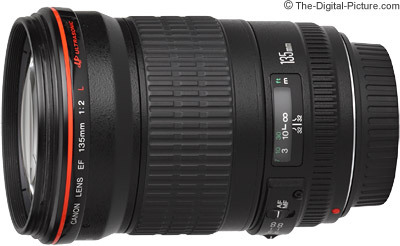 The Canon EF 135mm f/2L USM Lens is a very highly regarded lens. If a 135mm fixed focal length lens is what you need, the 135 L is sure to please.